Few countries have captured the world’s attention like Syria has today. Stories of conflict and displacement dominate the media and define people’s awareness of the place. Syria: A Living History brings together artifacts and artworks that tell a different story — one of cultural diversity, historical continuity, resourcefulness, and resilience. For over five millennia, this region perched on the eastern Mediterranean has witnessed great world civilizations commingling on its soil and producing art, literature, and culture that constitute the country’s rich legacy. Strongly informed by a distinctive landscape and history, artists of Syria throughout the ages have made priceless contributions to world heritage. 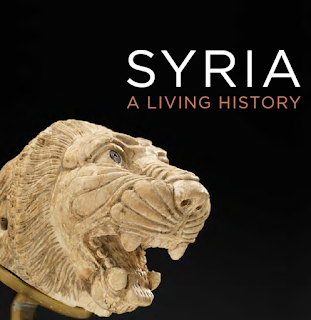 Syria: A Living History inspires new understanding of Syria’s past and present, and invites new ways of thinking about its future. "The national mood in Afghanistan is at a record low, and Afghans are pessimistic because of insecurity, corruption, and rising unemployment and slow job growth. At the same time, more Afghans, particularly rural Afghan men, now support women’s right to vote and women’s right to work outside the home than ever before. The 2016 Survey of the Afghan People polled 12,658 Afghan respondents from 16 ethnic groups across all 34 provinces, including insecure and physically challenging environments. The annual survey is the longest-running and broadest nationwide survey of Afghan attitudes and opinions. Since 2004, the Survey has gathered the opinions of more than 87,000 Afghan men and women, providing a unique longitudinal portrait of evolving public perceptions of security, the economy, governance and government services, elections, media, women’s issues, and migration." "Sabancı University Sakıp Sabancı Museum's Arts of Book and Calligraphy Collection includes copies of the Koran, prayer books, calligraphic compositions in the kıt'a form, calligraphic albums, calligraphic panels, hilyes, imperial firmans and berats bearing the royal tuğra (imperial cipher) by renowned calligraphers dating from the late 14th to 20th centuries, and calligraphy tools and equipment." The Syrian world : a monthly magazine in English dealing with Syrian affairs and Arabic literature. Published : New York : Syrian-American Pr., 1926-1935. "Sample issues of The Syrian World are available, along with full indexes and tables of contents for The Syrian World between 1926 and 1932. To access the complete, fully-searchable archive of The Syrian World, please contact the Khayrallah Center for Lebanese Diaspora Studies"
Published: New York : United Nations Development Programme, Regional Bureau for Arab States, 2016. • Major voices in contemporary Persian literature (1980) ONLINE. "Major Voices in Contemporary Persian Literature–Literature East & West 20 (1980), 351p, which consists of twenty-seven sections mostly presenting translations of poetry and prose and plot summaries of novels. in Major Voices.304-351.pdf, Rezâ Barâheni: A Case Study of Politics and the Writer in Iran, 1953-1977; and the volume’s concluding bibliography."